Swix Sport USA Inc. is pleased to welcome 2016 World Cup Champion Jessie Diggins as a Swix sponsored athlete. A steadfast competitor, Diggins has rocketed up the ranks of the International WC results pages since her debut at the 2011 World Championships in Holmenkollen. The official Swix Birkie wax recommendation will be posted here at 4pm today. Here are some must have items waxes and tools for the race. 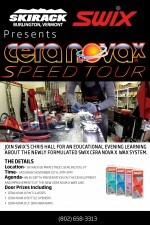 In the wake of Swix’s release of the Cera Nova X line, Swix National Racing Director Chris Hall is embarking on a year long clinic and outreach tour to educate people on the new waxes, lineups and products available through the redesigned system. Swix is a long time champion of the Nordic community, supporting programs, athletes, venues and retailers at all levels of the sport. Their long-standing sponsorship of New England Nordic Ski Association likewise supports NENSA programing along the entire pipeline, from the Bill Koch Festival to the New England Junior National Team and beyond. Given the new weather forecast, it is very likely that the track surface will be soft. With the snow event on Thursday day leading into the evening, expect softer conditions on race day. However, with the new snow, normal CH, LF and HF waxes will be the wax of choice. 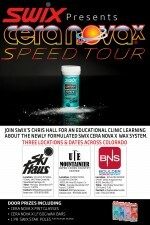 BW and Moly/Graphite waxes will not run well in these new snow conditions.